Time series analysis: forecasting and seasonal adjustment; analysis of forecast surveys and forecast uncertainty; density forecast evaluation. Macroeconometric modelling: comparative studies and policy analysis in national-economy and multicountry models. Royal Statistical Society, Member of Council, 1972-76. 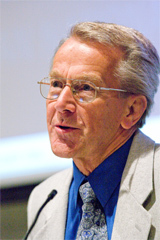 Econometric Society, Elected Fellow, 1975; Co-Editor, Econometrica, 1977-83; Programme Co-Chair, 7th World Congress, Tokyo, 1995; Member of Council, 1995-1997. ESRC Macroeconomic Modelling Bureau (1983-99), Director. Royal Economic Society, Member of Council, 1989-94; Founder Committee Member, Conference of Heads of University Departments of Economics (CHUDE), 1988. National Institute of Economic and Social Research, Governor; Member, Council of Management, 1997-2003. British Academy, Elected Fellow, 1994; Chairman, Section S2 (Economics and Economic History), 1998-2002; Member, Grants Committee, 2001-06 (Chairman, 2002-06); Member of Council, 2002-05; Chairman, Social Sciences Group, 2003-06; Member, Final Award Committee, Newton International Fellowships, 2008-11. BA Fellow's profile page. National Statistics Methodology Advisory Committee, Member, 2001-11.
International Institute of Forecasters, Elected Fellow, 2002. Winner, Guardian Prize Crossword, 2 June 2007 (Araucaria), 2 July 2011 (Enigmatist). University of Warwick Chorus. Summer Term Concert with UWSO, Sunday 23 June 2019, 3.00pm in the Butterworth Hall, Warwick Arts Centre. Programme includes Puccini, Messa di Gloria. ... and for a break, Burnbrae in the Scottish Borders.